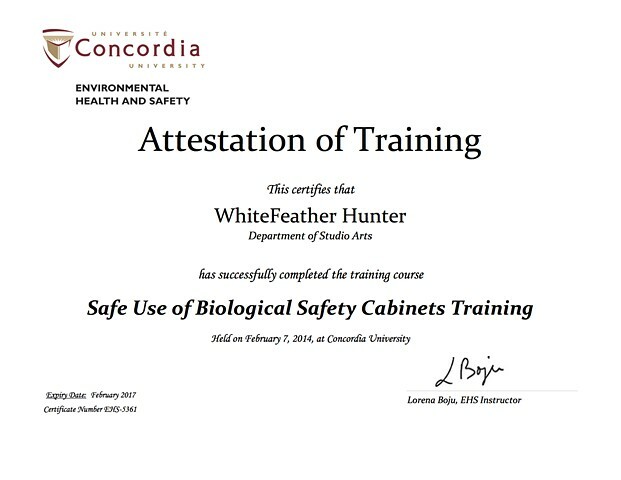 Certification and laboratory safety training is a critical component of any BioArt practice, where biohazardous materials and hazardous chemicals are used. The bureaucracy and strict institutional regulation of artists working in the BioArt field is an important part of the discussion around this type of work, closely tied to the ethical issues of working with semi-living materials and/or animal or human tissue. I consider this work and these objects (certificates) as an integral part of the visual material of this project.